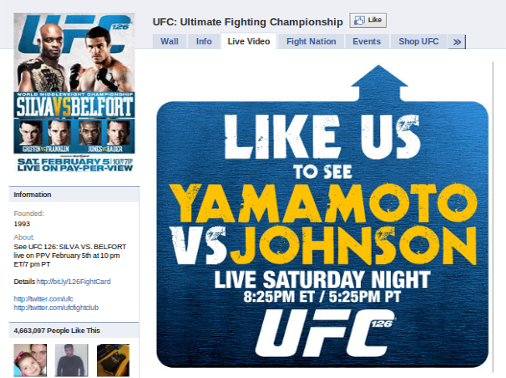 The Yamamoto vs Johnson bout at UFC 126 will air on the promotion's Facebook page for free. All fans need to do is click "like". UFC announced today that Facebook will broadcast Norifumi Yamamoto’s debut for free, as he faces Demetrious Johnson at UFC 126. So if you’re not cool with the news that Spike TV Prelims will not air this bout, all you have to do is “like” UFC’s Facebook page. However, many fans are not quite glad with this news. Some of them were whining that FB fights cannot be viewed on their phone, while others complain about Facebook’s frequent lagging during fights. Now, if only UFC and Facebook will listen, maybe they can work this thing out. How about you? Are you going to watch Kid Yamamoto’s UFC debut on Facebook?